If you are interested in working in the Indian postal department then you have a chance. 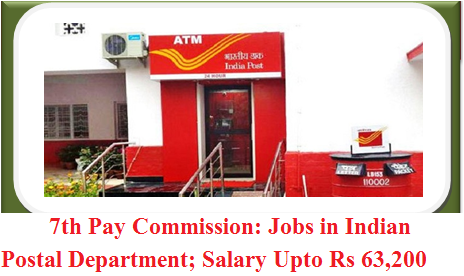 Under the 7th Pay Commission Pay band, applications have been invited from interested and eligible candidates for the position of staff car driver. If you are eligible for this post, you can apply before 7 September 2018. Pay Scale for staff car driver will be according to the 7th Pay Commission. The pay band will be between 19,900 to 63,200. Armed force personnel can apply or those who are likely to retire or who have to be transferred to the reservation within a year’s period. However their necessary experience and qualifications will be considered. The deputation criteria will be given to such candidates, after that they can get a job again. Age limit: Those who apply for this post should not be more than 56 years old. Candidates will be selected through written examination or interview. These are the necessary qualifications for officials holding the post of Dispatch Rider on a regular basis or regular Group C employees in Level 1 in the pay Matrix as per 7th Pay Commission. (iv) Pass in 10th Standard from a recognized board. Apply before 7 September 2018. Pay Scale for staff car driver will be according to the 7th Pay Commission. The pay band will be between 19,900 to 63,200.